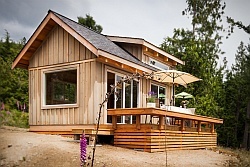 The Wee House Company is a recent Scottish startup offering energy-efficient small houses designed to appeal to first-time homebuyers, downsizing empty-nesters and anyone wanting to add a rental cottage or “granny flat” to their backyard. 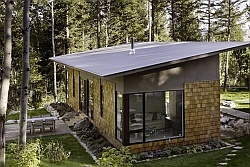 They now have three models, a studio, a one bedroom and a two bedroom, all based on rural Scottish vernacular houses. 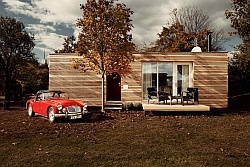 The houses are largely factory-built and delivered as modules, with delivery apparently available throughout the United Kingdom. Once at the final building site, only a couple weeks of installation and finish work is required, keeping disruption to a minimum. 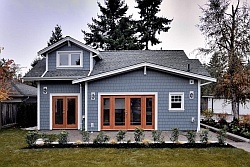 Purchasers can choose paint colors and finish materials, with more involved customization also possible. Here we show their one bedroom houses having 40 m2 (431 ft2) of floor space. The floor plan is essentially an L shape with the addition of a small entry vestibule at the front. The vestibule’s inner and outer doors will help keep cold air from entering in winter. Once you step into the living room, the kitchen is to the left while the bathroom and bedroom are accessed by a very short hallway on the opposite side. Scots seems to prefer having the kitchen in its own separate room, although here it is still fairly open to the living room rather than being closed off with a door as it often is. The bedroom, like the living room, is very bright with both a window and a set of French doors. Having openings on two walls allows for effective cross-ventilation in hot weather. Custom storage units incorporating nightstands were built on either side of the bed. The interior walls and floors are both finished with painted wood. The vertical installation of tongue-and-groove paneling on the walls is a style we associate with Scandinavian design but which seems to be common in Scotland as well. The Wee House Company is currently offering the one bedroom model for £75,000. Visit their website to learn more. Images courtesy of The Wee House Company. Via Naibann. What!?! No huff-n-puff or little piggy jokes? Great looking house…and they have a top-notch web site. Wow. This adorable cottage seems like it was made just for me — the colors, the fixtures, the furniture — it is me all over! This is REALLY nice. You could talk me into living here in a red hot New York second! Well done! I love this. I wish The Wee House company would start producing in this country. 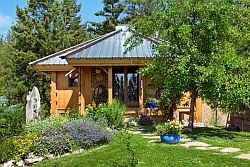 I am interested in purchasing a tiny house around 8 00 square feet in Solano Co California in the near future, looking to retire in 3 yearso would love to view them on site. WOW! 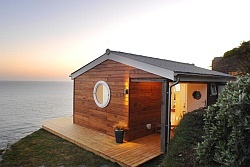 never knew you could fit all the nessecities of a house into what looks like a little cottage!